CEICS: -Why did you choose biology as a research field? Was the election related with political influences or the environment of social struggle in USA? Which were your major intellectual and/or political influences? 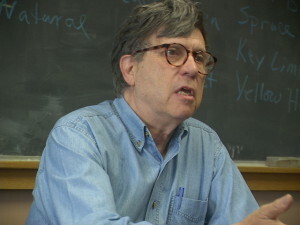 Lewontin: -I became a professional biologist because of the influence of a charismatic teacher of biology in my high school. He made the subject seem very interesting and worthy of a life’s work. Were if not for him I might have still become an academic, but an historian or sociologist or philosopher. One of the attractive things was that he made biology relevant to social and ideological issues of the time, especially racism. My friends and I were politically on the left in school (I don’t know why) and our teacher’s discussions of the lack of important genetic differences between races was very important to us and very influential. One must beware of looking always for deterministic answers to questions like where one’s political or intellectual interests come from. They are in some large part accidents of who your friends and family were, what teachers you may have had and a large amount of chance and unconscious influences. That is why I distrust autobiographies. mean a negative change for the academic freedom? L: -My political activities on the left, which were very prominent in the 1960’s and before, have had absolutely no negative effect on my academic life. I know that I have a record of my antiwar activities in the 1960’s in the FBI files, but during the Cold War, despite my helping to organize and leading marches in Chicago against the war, cosponsored by the Communist Party and the Socialist Party, I was never persecuted. You must understand that the challenge to academic freedom in the United States that was a consequence of dissident political activity caused persecution and suffering for only a very small number of dissidents and only for a short time. A relatively small number of people at a few institutions were picked out to be attacked by political forces and some academic administrations, but these were symbolic targets, meant to frighten others and to make the attackers politically popular. University authorities, in particular, cared more for academic prestige based on the intellectual accomplishments of their faculties than they cared for political questions. This was also true of U.S. government granting agencies. All during the time that I was most active publicly, my research was supported by the National Science Foundation, the National Institutes of Health and, believe it or not, the Atomic Energy Commission and its successor agency the Department of Energy. CEICS: -In our country, as in great part of the academic “western” world, the “affaire Sokal” caused an enormous commotion. Which was your position in that subject? Did it cause any lasting impact in the American academic world? L: -The political implications of Alan Sokal’s attack on the “new criticism” were really not as great as often supposed (at least in the US). Indeed, Sokal himself was politically on the Left. It did cause a sort but intense commotion but to identify the “new criticism” with classic leftism seems to me a mistake. Indeed, the whole new criticism movement called into question any absolute framework for understanding, and this was anathema to the conventional left. Also his success in having the article published and accepted was seen as a blow against non-materially based and arbitrary academic theories, a blow that many on the left applauded. I myself wish there was more activity exposing the vacuousness of much of the current trend in evolutionary biology which has cut itself loose from the demand for fact and proof, in the interest of making up something “interesting.” J.B.S. Haldane once remarked that something was “interesting, even if not true.” I despise that approach to science. If it is not true it is not interesting. A scientist’s job is not to show how clever he or she can be. Radically new theories are cheap and easy. CEICS: -It is possible to talk about a dialectic biology and, in that case, which would be its value for the future of the science? L: -By a “dialectical biology” we mean that things may be both causes and effects. Do hormonal changes affect emotions or do emotions cause hormonal changes? We do not have a “nervous system” or a “secretory system”, but a “neurosecretory system”. The old fashioned view that there is some correct way to divide up an organism or the living world in general, misses the point that different divisions are appropriate for different purposes. Organisms do not “adapt” to an previously existing autonomous environment. The life activities of an organism build up around it a set of relevant aspects of the outer world. Organisms “construct” their environments, and having constructed them may either prosper or do badly in that constructed world. That does not mean that organisms have “made” the water or the sun or the rocks. But the fact that we live in an atmosphere of 18% oxygen and very little carbon dioxide is a direct consequence of the evolution of plants and their life activities. Before plants there was very little oxygen and lots of carbon dioxide. L: -“Intelligent design” was invented in order to challenge the exclusion of religious ideology from public education. It has a big “influence” only in the sense that a very large fraction of the American public believes in the god described in the Judeo-Christian bible and a very large proportion of those people believe that the words in that bible are literally true. Since these people have some idea of the variety of organisms on the Earth and that those organisms are complicated and carry out many life functions to survive and reproduce, they must believe that the maker of the world (the designer) was intelligent. But who was that maker? The god of their bible, of course. So how are they to get their religion into the schools? They are not allowed, by law, to introduce their bible into the schools as a priori truth. So they must claim that if we look at the world of organisms, no natural process could produce, by long undirected evolution, such a variety of complicated organisms who appear designed to do what they do. They are too complicated to arise by an undirected process. The problem with this theory is that if they were created, then the intelligence that created them must be as complex as what was created. So who created the intelligence that created the organisms? In the end, the claim of intelligent design MUST be a claim for a supernatural god. But that is religion and religion is prohibited from the schools. So they are back where they started. led by Democratic Presidents, the South went to the Republican Party. This is a long and complex story which I cannot go into here. But the main thing to understand is that it is a class/regional issue, connected to adherence to fundamentalist Christian churches. L: -Biologists and psychologists have a vested interest in reducing human individual and social actions to “animal behavior.” By doing this they make themselves seem more important and universal in their theories. It is not a rebirth of social Darwinism, but a desire among academics to explain everything by their particular theories and so become “great” scientists. But we are no closer to a coherent theory of human individual and social action than we have ever been. CEICS: -Finally, in which project are you working at the present? L: -I am currently working on then properties of various methods that evolutionary geneticists use to detect natural selection in operation. These methods are largely in the form of statistical tests using the observed genetic variation in populations. What I am finding out it that these statistical tests are not a reliable way to detect natural selection. In the end we need to measure various components of the reproductive cycle in organisms in their natural habitats. That is a VERY difficult thing to do. biology, interview, lewontin, method, richard, science, true. Marcar.